Bender's core competence is electrical safety. We will answer your questions and put our knowledge and experience at your disposal. Find contact information or use our contact form! The residual current monitoring modules of the RCMB300 series are intended for measuring AC and DC fault currents in earthed systems (TN and TT systems). The modules are able to measure residual currents up to IΔ = 20 A in a frequency range of DC…100 kHz. Two separately adjustable response values allow a distinction to be made between prewarning and alarm. When the response value IΔn2 (alarm) is reached, the output relays K1 and K2 switch. The modules feature an RS-485 interface with Modbus RTU which can be used to transfer measured values and alarm values. Setting parameters is also possible via this interface. The residual current monitoring modules each consist of the RCMB301 evaluation electronics and a CTBC20(P)…210(P) series measuring current transformer core. To assemble a complete module, both the electronics and a measuring current transformer core are required; if ordered separately, these two components must then be plugged together and calibrated during commissioning. The measuring current transformer cores of the CTBC20P…210P series feature an integrated magnetic shield and are suitable for applications with high load currents or inrush currents. Required terminals are included in the scope of delivery. * At the time of ordering, the module is configured together with our in-house service, i.e. 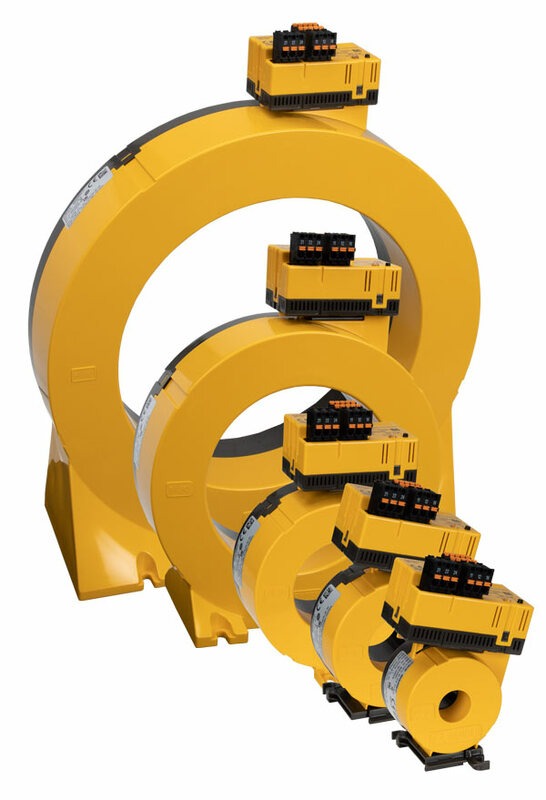 the transformer diameter required for the application is selected and it can be decided whether a shielded or an unshielded measuring current transformer core is required. It is also possible to order the module already assembled and calibrated. Otherwise, the assembly and adjustment must be carried out by the customer on site during commissioning.